OK today I’ll jot down very quickly what I have been doing with some success as regards looking for domains, finding one’s that may be suitable and backing that up with data. We can all look at a generic domain and agree that it has value and may be brandable but I am not really on the market for them at present, I want domains that are product based, domains that if ranked someone would search for which means I can generate traffic, income and possibly look to lease the domain at some point. With that in mind it is still hard looking for inspiration and that is what I’ll cover today. At the very start you need a word, product or general topic, for this I watch TV, browse the yellow pages, argos catalogue and Ebay which lists products that may give you a niche to investigate, for this example let’s take ‘gates’ which I have personally been after recently for my house. Firstly for ‘inspiration’ I use overture, I use the UK version for a UK slant. 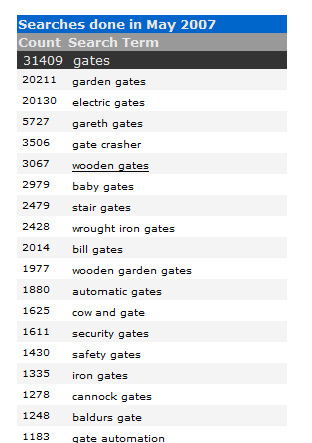 Entering ‘gates’ into UK overture gives us a general list of popular search terms, now I trust overture to give me inspiration as regards different word combinations (albeit sometimes in the wrong order) but I do not trust any of the search volume data really. Two word phrases may appear in the wrong order, for example doing a search for ‘office’ brought back ‘office post’ with 20,000 results or something stupid when it is clear the actual search term is ‘post office’ so you have to be wary of that. Now we have a list that is reasonably accurate as in the top search terms for the topic I would then want to check them through Google sandbox filter to see what sort of traffic they could offer. The sandbox tool lets you know how many expected clicks you would get if you were a top 3 advertiser using Adwords so can give you an idea of organic traffic and how the terms match up against each other. 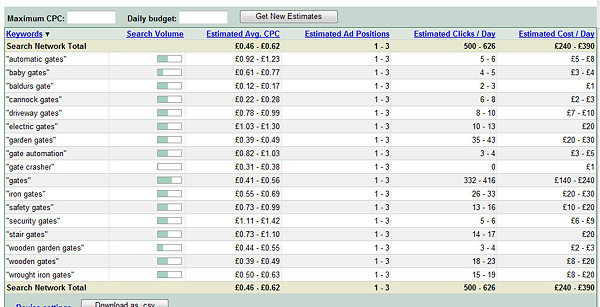 You also get an indication of how much advertisers would have to pay to be at the top. One thing to keep in mind is that if it’s more than one word you may want to use speech marks ” ” around the keyphrase to get a better exact idea of likely traffic, using the method above I found one domain that was available for registration which should be easy to rank and get around 10-20 visitors per day, I have also secured 3 very big domains all for around £1000-£1500 which if ranked in the top 5 would be very leasable in the £500 per month kind of bracket and even if they were not leased out should generate sufficient traffic to earn quite a few hundred each per month through ppc and more through affiliate sales (which I must try to get into more). This method seems more measured as regards choosing your battles, it’s quite baffling really at times as words get search volume that you would never expect, who would expect ‘outerwear‘ to be so popular? Oh and BTW I would love a share in Nokta – jeez that company seem to own sooo many decent domains you do find yourself coming across the same old familiar names & companies a lot when doing this type of research. So back on topic, you can check plurals against singular versions and different ways of describing the same product to give you a better idea of which one to target, sometimes products have a few names, is it house or is it home, is it bike or is it bicycle. The figures from Google unlike Overture can be conservative, if you were rank organically No.1 then you can expect a good bit more than that tool suggests, for example the Adword tool suggests 5-6 clicks a day for led bulbs which actually brings in around 30 per day for that one search term. Most importantly for me I am only looking for the exact domain, no hyphens and no added words, so if the search term that looks good is wood furniture then that is the only domain I am interested in, not woodfurnitureuk.co.uk or wood-furniture.co.uk, having the exact domain still has a very noticeable seo advantage for ranking. Other people probably have better ways of doing their research, sometimes I think it would be nice to be a coder and to be able to write programs to do things but there is still room for the small guy like myself just using what tools are freely available out there and if you do enough homework and send enough emails you will get dialogue and manage to secure some tasty domains that will seem cheap in a few years time, my plan is to make sure they pay for themselves back many times over long before I ever have to consider selling. Thanks for sharing Scott. Simple but effective advice. I didn’t realise the overture search tool hada UK version, thats handy to know, thanks. One thing – is there really an SEO difference between http://www.woodfurniture.co.uk and http://www.wood-furniture.co.uk? I’d understood that Google sees hyphens as space so wouldn’t the second url be a closer match? My goal would be to lease, therefore the lack of the hyphen makes it more attractive & brandable to lease to a company imo, it’s been mentioned on forums that the end user sale price of a hyphen can be 10% the phrase without the hyphen, so because of my long term gameplan and one day my portfolio would hopefully be worth selling as a going concern or individually I prefer no hyphen, for ranking & SEO though you would be right the hyphen is no disability so wouldn’t be a problem. A good source for inspiration is the show from Discovery: How It’s Made because it consists mainly in commercial products. I also have a subscription at Niche A Day. Nice one Adrian, thanks for sharing, great idea with the Discovery channel especially. I have heard that Overture’s search count section is not being updated and is rapidly getting out of date. So it is worth bearing this in mind when using it. I’d totally agree with you but it is handy for taking one word and generating a list of popular keyphrases for a topic that can then be verified through the Google Tool for more accuracy as regards potential traffic. Thanks for the information. I tried out the Google Adwords tool that you mentioned. This is a great tool. I will definitely remember to use this going forward. How long do you estimate it will take until you can lease it out? Also do you host the sites on different IPs for now? I have signed all paperwork for my first lease so just now I am buying some real gems of domains for the future, all next year will be about ranking and leasing for me I think, I don’t worry about diff IP’s Justin. But would it not be quicker to get them to page 1 of Google if they’re linked from separate class C IPs? Depends on how competitive the terms are, if its 1 to 3 million results it is usually pretty quick, if not then relative links work, same IP’s or not. I don’t get bogged down with some of the dross/stories you read on SEO making it more complicated than it actually is, simple works fine for me,for example in Google.co.uk LedBulbs.co.uk site is ranked No.1 and has made over $12 today. The different IPs for SEO is a bit of a myth, I wouldn’t worry about that at all. Do you have any evidence to disprove the myth? I don’t have anything that I can/will quote but I don’t give it a large amount of weight, as always depends on what fights you are picking, I am not chasing 100+ million result terms, only on extremely competitive terms IMO do such things really come in to play. And I can’t find the article that I really wanted to link to, but there was a really good one about this a little while ago. I also do a bit of work with and chat to a couple of top SEOs in the UK and both agree theres nothing to be gained from using unique C classes. I read both articles, and neither comment on value of links on IP addresses within the same class C or D IP block. They are just about dedicated vs. shared/virtual.